Farmers interacting with scientists at MARD project site. Think of two scenes: barns that are filled with rice grains versus barns that are empty. How do we fill up empty barns? At the Regional Agricultural Research Station (RARS) in Diphu, Assam and at the Indian Council Agricultural Research (ICAR), in Borapani, Meghalaya, varieties are continuously being developed and validated by scientists with the purpose of filling up empty rice barns. In 2011, through CURE – ICIMOD partnership under the Technology Innovation Services (TIS) funded by IFAD, three upland autumn rice varieties, namely: Inglongkiri, Dimroo, and Maizu Biron were validated at six different project sites. These sites were in Ukhrul district of Manipur, East Khasi Hills distrct, Jaintia Hills district, Ribhoi district and East Garo Hills district of Meghalaya and Hamren subdivision of Assam. The validation focused on the performance of the above varieties under varied agroecological situations in North East India. 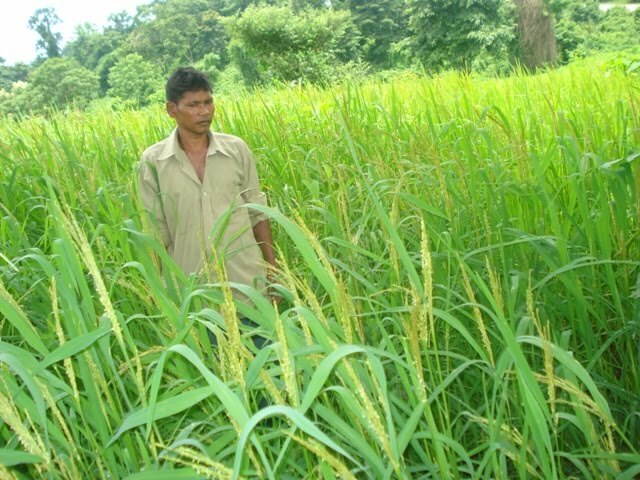 Simultaneously doing continuous varietal validation work in Assam, Meghalaya, Nagaland and Manipur, scientists are also training the farmers on production technology of high-yielding upland autumn rice varieties at RARS. Actual trainings on production technology of upland autumn rice varieties and autumn rice based cropping system were organized by RARS, Assam Agricultural University Diphu in 2011. A total of 18 participants (1 female and 17 male farmers) including the project supervisors of MRDS & NERCORMP were trained. Trainees were given a lecture compendium and leaflets on production technology of upland rice variety ‘Inglongkiri’ and ‘Rice based cropping system on upland’. 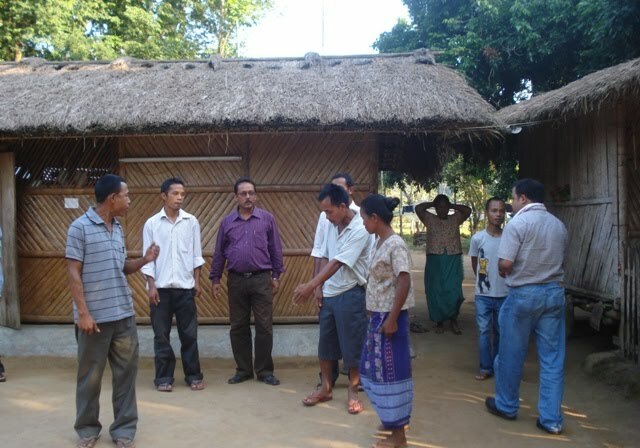 An exposure visit was organized and participants were taken to the different demonstration sites of Karbi Anglong district. All the trainees, along with local farmers, visited the demonstration plots and exchanged their views on the cultivation of upland rice. The seeds of upland rice varieties Inglongkiri, Dimroo, and Maizu Biron were handed over to the trainees at the end of the training. 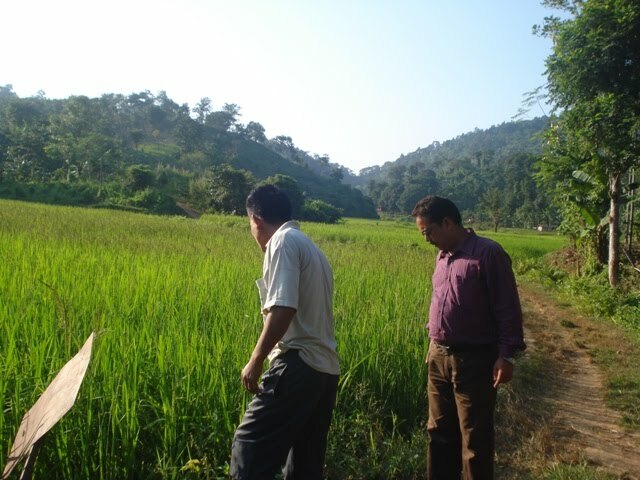 In 2012, 10 farmers participated in the validation process in four project sites under Meghalaya Rural Development Society in East Khasi Hills distrct, Ribhoi district, East Garo Hills district and North Garo Hills district of Meghalaya. Farmers’ fields were planted with the seeds that they were able to save in the 2011 validation trial. All the demonstrations were completed successfully. The average yield of ‘Inglongkiri’ was 2.8 t/ha and for ‘Maizu Biron’, 2.6 t/ha. Participating farmers were satisfied with the performance of both varieties and expressed their willingness to continue planting these varieties in the future. In east Garo Hills, the performance of the varieties was well appreciated by the farming community. The farmers sowed the varieties in May and harvested these in August 2011. Farmers, however, mentioned that although the rice varieties were good, these being an early maturing variety attracted birds and wild boars. All the varieties took much shorter period to ripen in comparison with the traditional varieties owned by the farmers. Scarcity of quality seed is common for upland rice growers. It was observed during the implementation of TAG 706 that upland farmers in North East India used major portion of their kept seed as grain during the time of grain shortage. This resulted in the development of seed village and community seed bank for improved seed production, management and storage under TAG 706 and continued under TIS of CURE in Meghalaya. Seeds of two upland varieties (Bhalum 3 & 4) developed at ICAR, Borapani were provided to North East Regional Community Resource Management Programme and grown in Meghalaya and Manipur states. In Manipur, Bhalum 3 performed well and multiplied seed was distributed to farmers from 22 different villages. In Meghalaya, the seed village, developed under TAG 706, produced 120 kg seed each of Bhalum 1 and Bhalum 2. These seeds were then given to Bethany Society, NERCORMP (in Meghalaya) and Phek District Farmer’s Union (in Nagaland). Bethany society distributed these seeds to 37 farmers (21 men and 16 women) in two districts. Farmers from West Khasi Hills who received these seeds got an average yield of 2.4 t/ha; while those from Ri-Bhoi obtained a higher average yield of 2.9 t/ha. Another 22 farmers (13 men and 9 women) received seeds from the produce of West Khasi Hills and Ri-Bhoi district. Phek District Farmer’s Union (Nagaland) distributed seeds among 10 farmers with 50% of the total produce bought back by the Union. Average yield was 1.9 t/ha. Low yield is probably because of altitude of the site (1700 m asl). In Ri-Bhoi district, preliminary guidance and seeds were provided to 10 farmers with options for demonstrating mono or mixed cropping system. Options for weed control were discussed and adopted by farmers. A total of 2300 kg seed was produced of which 500 kg were bought back by the Institute. Teaching farmers. Accompanying the seed packets which were distributed to the farmers was a two-page instruction sheet. Farmers were shown actual use of light and manual farm implements. In addition, short video films (also in CDs) on land preparation and line sowing were distributed to farmers for viewing, either on their mobile phones or their CD players. A seed storage structure made from locally available bamboo material and with charcoal as a desiccant was demonstrated. Non-rice concerns. 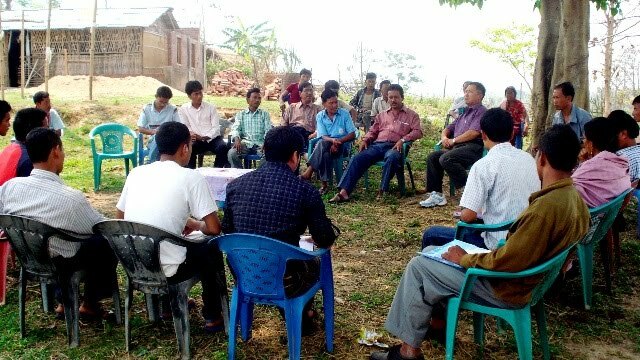 Farmers informed a team of scientists from RARS, in their dialogue with them on October 28, 2012 in North Garo Hills district of Meghalaya, that pests and diseases are infesting their two major crops, arecanut and citrus, as a major threat to the livelihood of the farmers. To meet the information needs of the farmers, RARS organized another training program on November 14, 2012. A total of 10 farmers (9 male and 1 female) from the project sites of MRDS participated the three-day training. Scientists also covered the practical demonstration on management of citrus and arecanut orchards, preparation and application of Bordeux mixture, trichoderma enriched Farm Yard Manure etc. Trainees were taken to the arecanut orchard at RARS, Diphu experimental farm and citrus garden at Hidisajir, about 10 km away from RARS, Diphu. Here, they were shown the different aspects of orchard maintenance, disease and pest management, nutrient management etc. by the scientists. To aid in their memory recall, trainees were given lecture compendium on the different topics discussed during the training programme. They were also given leaflets on production technology of newly developed rice variety ‘Haccha’ and ‘Disease management of upland autumn rice’ during the training programme. Still during the same training, participants were taken to the experimental field, horticultural nurseries, orchards, technology information centre at Assam Agricultural University, Jorhat. All the trainees expressed their satisfaction with this exposure visit. “It is a great experience for me. Now I am realizing that we have so many things to learn to develop our agriculture. Farmers are not alone. There are many people thinking about their welfare, willing to work for the farmers and with the farmers. We must convey to our fellow farmers what we have observed today,” says Mr. Madhunath Sangma, one of the trainees. With the above efforts from both sides - scientists and farmers, the future for boosting up upland rice harvest in Northeast India is bright indeed. Under Technical innovation services, a partnership was formed in 2011 among the CURE-NARES partners: Assam Agricultural University, Assam, Indian Council Agricultural Research, Borapani, Meghalaya nd Meghalaya Rural Development Society (MRDS) and NERCORMP from ICIMOD. Activities related to upland rice production in North East India were worked out in a joint meeting held in Shilong, Meghalaya, India during March 2011 in the presence of scientists from IRRI. Dr. Ramen Kumar Sarma is a principal scientist at Assam Agricultural University (AAU) in Assam, India.